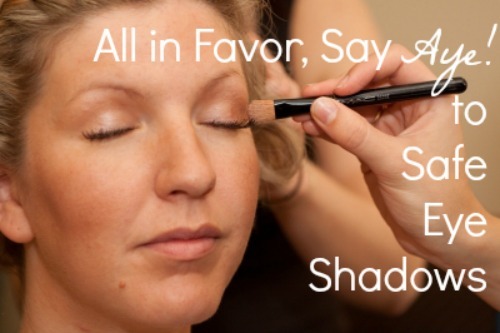 Eye shadows may be one of the most fun types of cosmetics a woman can choose, just because the wide variety of colors can dramatically change a look. Shocking lime green eyelids look a LOT different than smoky gray ones. The good news is that, for the most part, many eye shadows are safe. The Environmental Working Group has ranked 1,737 different eye shadows – and 675 are considered low hazards. That’s 675 safe eye shadows! An additional 1,049 are moderate hazards. And just 16 are high hazards. What’s so toxic in the high hazard products? Thirteen of the high-hazard eyeshadows are dangerous because of two ingredients: propylparaben and butylparaben. These ingredients are considered dangerous because parabens accumulate in breast tumors and are toxic to your developmental and reproductive systems. L’Oreal HiP Studio Secrets Professional Shocking Shadow Pigments, Valiant 534, contains BHA. BHA is an ingredient that’s banned from cosmetics in the European Union because it disrupts the endocrine system, is a known human toxicant, and aggravates allergies. The Natural Brown and Jet Black varieties of Black Radiance Starry Eyes Shadow Stick contain retinyl palmitate, propylparaben, lilial, benzyl salicylate and hydroxycitronellal. Retinyl (vitamin A) palmitate is toxic to your reproductive system and organs. Lilial aggravates allergies and disrupts your endocrine system. Benzyl salicylate disrupts your endocrine system and is an ecotoxin. And hydroxycitronellal aggravates allergies. Since there hundreds of safe eye shadows to choose from, wearing safe cosmetics isn’t as difficult as it once was. That’s fantastic news! What’s your favorite eye shadow?